For over 5 years, the Commitment Award has supported various social projects! 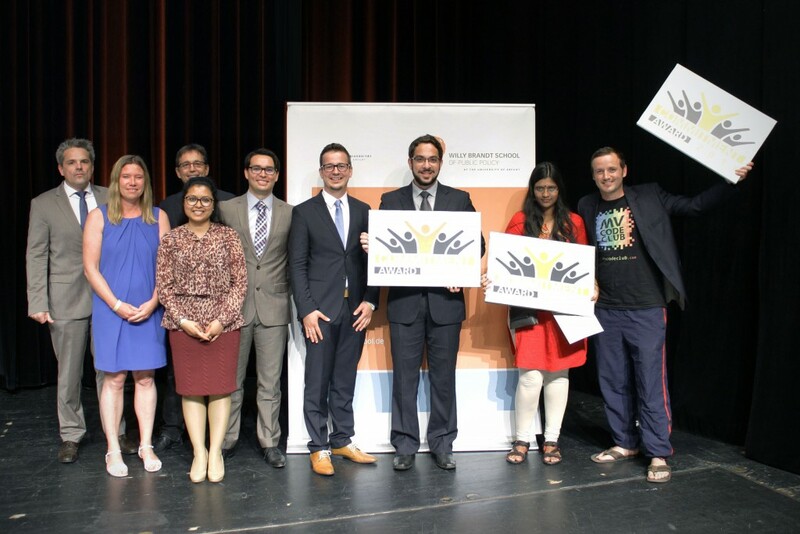 In close cooperation, the Engagementpreis Foundation and the Willy Brandt School of Public Policy, have together been organizing the Commitment Award since 2012. Willy Brandt himself represented social change, reflected in his social and political reforms. He believed that policies served no purpose if the policy makers did not have a specific goal in mind when creating it. Thus, in the multicultural and diverse setting of the Brandt School, the Commitment Award seeks to give students the opportunity to apply what they’ve learned at the Brandt School and to initiate new social initiatives in Erfurt (where the Brandt School is based, and around the world. Starting in 2014, the Brandt School is accepting applications not only from current students, but also from alumni. Three winning projects will be chosen at the annual award ceremony in July, after careful evaluation of the applications by a jury of experts. This jury thereby considers the following questions: How charitable is the project? How much potential and sustainability is incorporated into the project? Will the prize money be used responsibly and effectively? Is the project likely to be actualized? Over the last 4 years, 12 project have been rewarded price sums between €1,500 & 2,500 euro’s. For example, the 2014 winner Julia Oestreich, who’s ‘weaving for independence’ empowers Sri Lankan women with workshops learning them to produce and sell textile products. Or Marufa Akter’s ‘Open Sky School’-project, providing free education to homeless children in Dhaka, the capital of Bangladesh. The Commitment Award is endowed by the Engagementpreis-Stiftung gUG (haftungsbeschränkt), HRB 68952, AG Düsseldorf, managing director Markus Pins. Donations to the Commitment Award are tax-deductible. The Engagementpreis-Stiftung gUG promotes education, international ethos, tolerance in all cultural matters and international understanding as well as civil commitment and is therefor tax-exempt under German tax law (Freistellungsbescheid des Finanzamtes Düsseldorf-Süd, StNr. 106/5772/0540 dated 1.12.2016 for tax assessment period 2014 pursuant to § 5 Abs. 1 Nr. 9 Körperschaftsteuergesetz and § 3 Nr. 6 Gewerbesteuergesetzes). The Willy Brandt School of Public Policy is a semi-private University based in Erfurt, Germany. Their 2-year master program has been educating the future leaders in Government, civil society, and private enterprises. The collaboration with the Engagementpreis-Stiftung thereby offers its current students and alumni a chance to work on social projects around the world. Copyright © 2019 commitment award. Theme: Himalayas by ThemeGrill. Powered by WordPress.